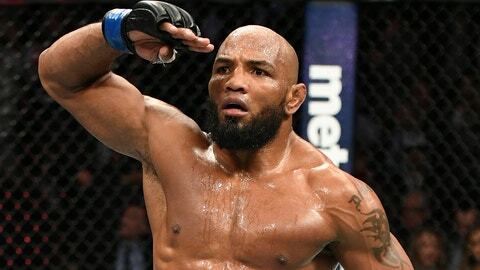 Yoel Romero has never been known for his trash talk, but he’s upping his game in anticipation of a showdown with middleweight champion Michael Bisping later this year. The Cuban-born Olympic silver medalist in wrestling was confirmed as Bisping’s next opponent, but he’s currently waiting for the champion to heal from a minor knee surgery he had just recently. 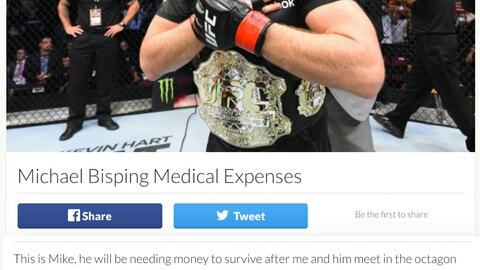 “This is Mike, he will be needing money to survive after me and him meet in the Octagon approximately May of 2017,” Romero wrote on the GoFundMe page. “He is happy in this picture after defending his title against another fighter and the devastation he went through has caused him to have surgery on his knee where all the visible damage was on his face. Romero’s post comes on the heels of Bisping’s attack where he blasted the No. 1 middleweight contender for cheating after he tested positive for a banned substance last year. Ultimately, Romero was found to be a victim of a tainted supplement and USADA (United States Anti-Doping Agency) suspended him six months as opposed to a potential two-year sanction if he was found at fault. Either way, Bisping has been targeting Romero’s drug testing history while the top-ranked challenger is now claiming that the champion may never fight again after he’s done with him. The fight between Bisping and Romero still isn’t official but if it seems like this is just the first taste of the trash talk that will be unleashed between these two middleweights over the next few months until they finally meet in the Octagon.